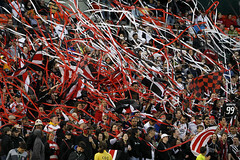 D.C. United Says: Have Cinco de Mayo With Us! D.C. United takes on Kansas City tonight at RFK, but before the game, they’re having a huge pre-game party in Lot 8 at RFK with Live Mariachi music and piñatas and cheap margaritas and empanadas all night! Sure, it’s not Lauriol Plaza or Rio Grande, but there’s going to be a whole lot more elbow room, and the drinks will be just as tasty out at RFK, and this way, you can do something that’s actually part of Latin American culture: watch a fútbol match afterward! Kickoff’s at 7:30 as United goes for their first win. It’s too bad, I stopped going to DC United games when their online cheap ticket prices shot up to $48., ticket fees included for a team with an 1-5 record. Where are the days when tickets were $15? Sigh. Not willing to line Commissioner Don Garber’s 3 million a year pockets.